From a nature reserve to the offices of a marketing agency to the Pantheon in Rome, students across academic disciplines are exploring these important spaces up close and often with tour guides—even if the students are located 10, 50 or thousands of miles away from the sites. 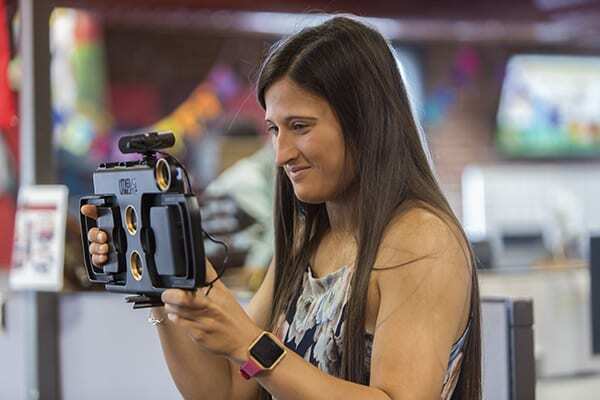 Using high-end technology such as Oculus Rift headsets and Google Cardboard, along with 360-degree photographs and video, faculty across academic programs are excited about the learning potential of the virtual reality (VR) devices. Students in Krakos’s lab contributed two-minute videos describing their research in the spot where it was collected, photographs of themselves in action, images of plants up close and research posters, all of which are embedded in the video as clickable matter that provides more in-depth information. Deanna Deterding, biology major, is excited to share her research through the VR experience. “The most gratifying part of this project was knowing that I would be helping to educate students in classrooms that don’t have the ability to do research at a nature reserve,” Deterding says. Shelby Whaley, ’18, also worked on the Shaw video project. She’s planning to attend graduate school next fall to study ecological restoration and management. “I think VR videos are a great way to include external content. Some aspects of a subject are just not available or possible to comprehend without seeing it,” Whaley says. 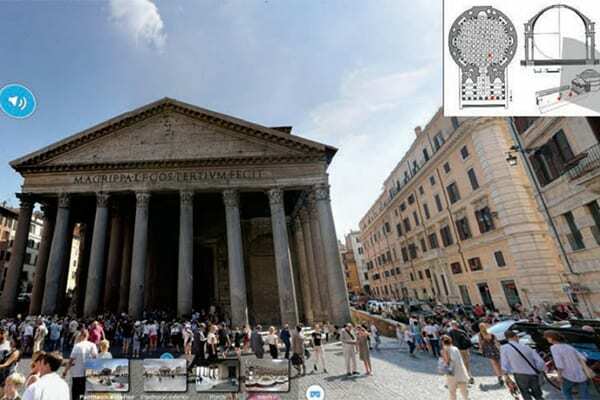 Todd Brenningmeyer, PhD, professor of art history, created a 360-degree video for his World Arts and Ideas course so students can explore Rome’s ancient Pantheon in more personal and detailed ways. “The idea is to allow students to interact with a space as if they were there, much like we do in our study abroad classes,” he says. “When you visit the Pantheon, you’re walking around, looking at the columns, you’re in the space,” he says. Typically, an instructor will show students images—slides or photo-graphs—of the outside of the Pantheon and of the dome on the inside, but students aren’t fully engaged in that experience, Brenningmeyer says. “We’ve created a way for them to explore the whole exterior of the Pantheon, then gradually make their way inside, looking around and above them as they walk,” he says. “This is how you want to experience it; you want to be feeling the space.” Brenningmeyer embeds audio links in his videos, so students who are interested in a particular feature can learn more about it. “The audio talks about where they are, just like I would do if we were on site and taking an actual tour of the building,” he says. 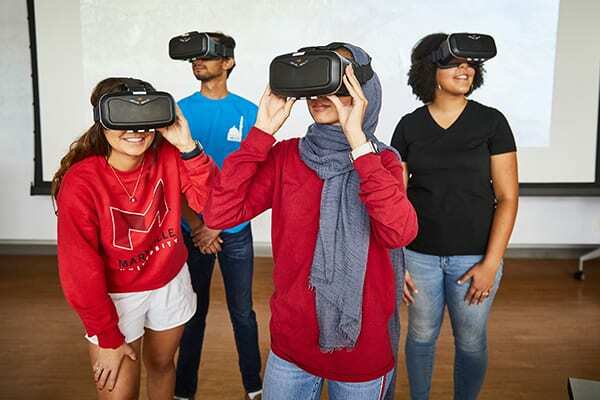 Using his library of VR videos, students can explore 20 other important historical sites, such as the Colosseum, Stonehenge, the Egyptian pyramids, an Etruscan cemetery and the Terracotta Army. “For communication majors, their favorite experiential learning opportunities are agency tours,” York says. 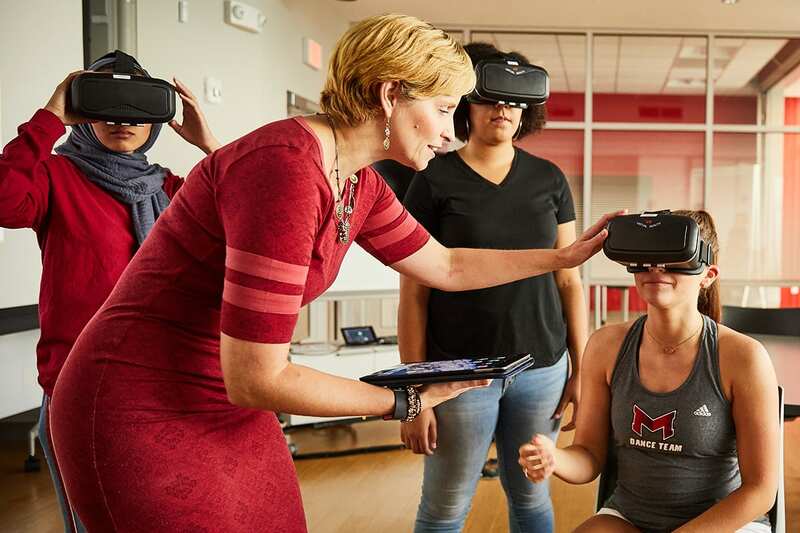 “We decided it would be cool to create a VR collection of tours for the benefit of students who can’t join us, but who are curious about the office spaces.”Every semester, Dustin York, EdD, director of the communication program and assistant professor, introduces a class project to explore an emerging technology. There are no step-by-step instructions provided—students collaborate in small groups to learn the skill. Last spring, York’s students created an Alexa app and previously designed a Snapchat filter. This semester, his students are creating a VR video featuring a tour of Abstrakt marketing agency’s downtown St. Louis offices. The learning outcomes are two-fold, York says. Primarily, the knowledge gained puts his students one step ahead of other job candidates. “Two years ago, we studied drones. Afterward, one of our students got an internship with TedX because he knew how to fly drones and no one else did. It’s the same with this project. Virtual reality is only going to become more widespread, and my students will be at the edge of that,” he says.